This modified classic features longer non-slip handles and a large turning crank. Easy crank can opener includes bottle-opening hook. Rubberized handles; stainless steel body. Hand wash. 8 5/8" Long x 1 3/4" Wide. Works quickly and cleanly. The handle is comfortable and allows for a good grip on the can to be opened and the crank works well. My mother had a wrist replacement and also suffers from Rheumation arthritis. This item has given her more freedom in the kitchen and helps her stay more independnt. Great item for all. love this product. wanted something that would open cans and be easy to use. This is it. a great product. The only con would be that sometimes the handle is a little long for the can size, but is easily adaptable. I would buy this item agian. it would make a great gift. I find this can opener extremely helpful. It's nice & quiet when i use it instead of my loud electric can opener late at night when my family is napping for sleeping. I wish I would have bought it sooner. This is it! For hand mobility problems! My hand is numb, so I have moblity issues. This is the best can opener hta I have ever used. It makes a difficult, almost impossible, job easy! Love this can opener 2nd purchase 4 me,gave away my first one. Had to replace it. Works very well for those of us with arthritic hands. A few quick cranks and the can is open. Works very well. I don't plan to ever be without one. Makes opening cans a breeze. Love it! The best ever can opener. Thanks for a really great replacement for the old can-openers. I will buy the easy crank can opener again! The easy crak can opener is great. I love the crank which makes it easy to use. I have problems with my hands and this can opener is better than an electric can opener! this is much better then an electric one, we had too many of them, none worked as well as this one. made my husband happy and when he is happy then I am too! Bought this because I've been having a lot of pain in my hands and wrists due to arthritis and I don't particularly care for electric can openers. It does make the cans much easier and less painful to open. My grandkids think it's cool and love to use it. I could hardly use a regular can opener because of the numbness in my hand. So this was a God send. It works great. Bought this one as a backup. Loved the first one so much, wanted to be sure I had a backup if it broke. Great investment! Loved the can opener so easy to use. Works well with most cans. However, if the can is small, you'll need to sit the can near the edge of the counter to accommodate the length of the handle. I think it works great for opening large cans. I needed a can opener I could use and not break. This one is perfect. It is an very easy to use opener and I can hold it and crank it all by myself. That is nice. Actually does what it says it's gonna do! Ordered one for myself. Really like it so ordered a second for my 96 year-old father. He's learning how to navigate around the kitchen to cook for himself and I think this will make can opening easier for him. This product is wonderful, easy to use. Easy to use on any size can. I love it!!! I bought three of these and shared with all my friends who suffer from arthritis. The long crank makes opening cans painless. I cannot recommend this product enough. This is the easiest can opener I have ever had. Electric ones quit working, And cans are hard to hold on to. Other hand openers are hard on the wrist. This one is easy all the way! Yea!!!! Awesome can opener. Handles all cans even up to number 10 with ease. Recommended. Good as any electric can opener. The handle on this opener sticks out quite a ways and the end you clasp together is bent slightly. I was not sure this would be a good opener. But, then I started to open a small can of beans, I was afraid the opener would drop the can but, it didn't. I realized the can was already open that quickly. The next can was larger, so I let it rest on the counter and the opener did all the work. This opener is easy on your hands if you have some arthritis in your hands like I do in mine. I recommend it. I have arthritis in my hands and other can openers are just too difficult for me to turn the handle...this one is perfect and so smooth. I have arthritis and can openers are hard to handle. This long handle makes it super easy. It works really well . I liked this product so much I ordered one for my daughter. It's a "keeper". This is the perfect can opener: better than electrics or battery operated - totally reliable. I purchased this product for several friends because it is so easy and fast! This opener is definitely a MUST HAVE in every kitchen. I love this can opener! The long handle is comfortable and is easy to use. I am planning to buy another one as a gift for a friend. If you have small or weak or arthritic hands this can opener will make the task very easy! It is far easier to use than my electric can opener, and much easier to use than any "regular" can opener I have ever owned. Worth every penny! Great for people with limited hand strength.....easy to handle and to turn the crank. The crank handle makes this can opener ideal for use in our Community Hall Kitchen. Many different groups use the communal kitchen and not everyone using the kitchen can operate a twist handle on a can opener. Great can opener, plan to buy more. Opens all size can with ease. Would definitely recommend this can opener. First time I could open a can with so much ease. I have arthritic hands and dreaded when I had to open a can (have tried many different openers) and using this one was a pleasure. This is the best can opener I've ever had. You simply put the cutting bar over the edge of the can and turn the crank. Doesn't even usually have to puncture the can before cranking. Cranking is super easy. No fighting to open cans. Better than electric or self-opening can openers. My daughters, and best friend are in love with this can-opener. Wished they had it years ago. Works great. Wish I had thought of it! I use it for both large and small can! I love it! This is the best can opener I have found. Great for older people with arthritis or any other problems. my wife suffers from rhumatism in her hands and doesn't have the strength to use a regular can opener, if i;m absent. I had one like this and I love it so I purchased this one for a gift for our daughter because I've watched her struggle with her old one and even a new style her husband bought.......KNOW she will be happy with this one! ELECTRIC CAN OPENERS ARE JUST CRAZY FOR HANDICAPPED, AND THE USUAL MANUAL ONES ARE TOO HARD TO TWIST TO OPEN. THIS CRANK IS SO EASY TO OPEN ANY SIZE CANS. Great product! I was using the old "Key" type and that was killing my wrist & hand. I don't want to use an electric can opener because I'm going "green" when I can. This product helps me do that with no pain. To the inventor: Thank you so much! I really like this. It is very easy to use & opens the can with no problem. I have developed arthritis in my hands & this is easy - doesn't require a lot of "strength" to open anything. I was done before I realized it.The hand crank turns smooth. Works very fast. It doesn't leave such a big edge on the inside as other openers I have tried. Very smooth operation, quick and I wash mine on the top rack of the dishwasher. I LOVE THIS CAN OPENER! I HAVE ARTHRITIS IN MY HANDS, THIS CAN OPENER MAKES IT SO EASY TO OPEN CANS I AM DELIGHTED!!! NO NEED TO PRESS, TO PUSH , NO NEED TO TRY HARD. IT OPENS IN A SECOND. I love it. It's great if you have arthritis in your hands. I cannot use the other can openers with those little handles on top that you have to turn, they are hard to turn and hurt my hands. I looked in all the stores and this is the only place I found this item. so far, I haven't had a problem with it. It grips the can well, and the crank handle makes it much easier to keep it turning. I finally found an opener that works and is easy to use. I have arthritis and this helps so much. I have torn tendon in my dominant hand and cannot operate a normal can opener, and no counter space for an electric opener. This is great and it is no trouble to use. My hands are not strong, this opener is excellent to open cans. I love it so much, I purchased 2 from your company. This is the best can opener I have ever used! I switched to manual can openers because electric ones couldn't handle larger cans. When I found this long-handled can opener and tried it, WOW! I bought one for myself, my mother, my aunt, my sister, and my church. Best can opener I ever had. I use it at home and at my church. Great things about it good for young or older people and weak or strong hand. I buy this can opener and give them to family. It is so much easier to use than the ones with small cranks. So much easier for my elderly Mom to open cans! I have bad joints and do far this is great. It works well and is easy to clean. Inlove this it makes things so easy. Opening can with no strength makes it easy. Hand Crank Can Opener is a REALLY GOOD IDEA! Sometimes it's VERY HARD to turn the "finger crank" type manual can opener. This "Easy Crank Can Opener" is a wonderful product. I enjoy using it & I've sent one to a friend that has trouble w/her hands. She LOVES IT TOO!!! I no longer can find this product in the Kitchen Stores and was Delighted when I saw Walter Drake's catalog carried it! Thx. Great for opening the big No. 10 cans when cooking for a crowd. I have arthritis and it's great not to have to twist my wrist. Because of the size of the crank, larger cans open in less turns. open cans, easy to use, can't use on shorter cans unless you have something to set them on. This opener has been a life saver for us seasoned citizens. My wife is an avid cook and cans were beginning to turn her off. Her hands were really bothering her and using the can opener was painful. Now, she's back to her old self and cooking up a storm. Why didn't someone think of this before. I've seen commercial openers but the price was very expensive. This tool is great!! This is the best can opener I have ever had, it opens cans so easily. I would buy this again if needed. This can opener is much better on my hands. My fear is the crank will break. This item takes some practice to use steadily. You have to use it on the edge of the counter so the long handle can hang over it. When you crank the handle it makes the can unstable, so you need practice to keep it steady. If you get past that it works just fine. Good product. Very poor packing. One end of the box was open when I received it. 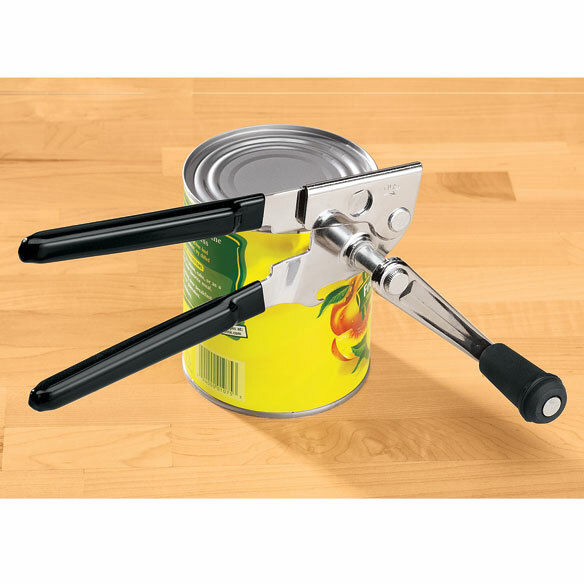 I've tried everything out there and this is the easiest can opener. It was easier than I thought it would be. It seems to work on any size can. I don't have much grip strength so it is a little hard for me to puncture the can, but with both hands it can be done. The rest is easy. Because of limited strength and mobility it works pretty good. I like this product. The only problem I can see is that if you are opening shorter cans - you have to hold the can up off the counter because of the crank. I've learned to hold the can over the sink - just in case of a liquid spill. But, other than that - I really like it. Not as much tension on my hands (getting older as years go by). This can opener makes the task effortless. It's so easy to turn the crank. The can is open in 2-3 turns. Easy on arthritic hands. The only small complaint is that it is heavy. Bought it for my elderly mom. She loves it. Too large and heavy for people with hand issues. Can't open short or small cans because the handle is too long. Ended up returning this product. Used the can opener twice, worked great; but the third time was the charm! Wouldn't work and never worked again. Returned it for a refund. Can opener is very heavy, too hard to squeeze onto can for arthritic hands, crank is too long--it hits the counter, so you have to place it somewhere away from counter top. It is also too expensive. I would send it back but postage is too expensive. For power outages to replace my electric can opener. II'm 96 and my grip is not what it used to be. Needed a can opener that had a larger turning handle so it would be easier for my husband and I to use. I have used one and I think they work great so I got one for me and one for my sister. I can"t use the one I have now. I have hand strength problems. I have a hard time opening over large cans of food with a regular hand held can opener. It is becoming harder to turn a regular hand can opener and I remembered my Granny had some of these types of can openers and they worked very well. I hope the ones that your company offers work as well. My son has one, and it is great! This is the greatest canner opener for those of us with limited hand strength. I bought a backup. I have 1 and I love it!! I want a backup just in case! Haven't seen anything like this before. Numerous hand held battery operated openers haven't worked. Hopefully will work for elderly, arthritic hands. My mom is having trouble opening dog food cans and asked for it. My mother chose to try this can opener before trying to find an electric one that she might like. She prefers this kind of can opener but is having trouble with her hands but feels this will be easier for her to operate. my wrists are getting weak and I need more leverage as I wind the stem on a typical CanOpener. This should give me the leverage that I need to easily open a CanOpener.I hope it does. My present can opener does not have the crank feature. Arthritic hands-product looks like it would be helpful to me to open cans. I have lost a lot of strength in my fingers, and this crank can opener would make opening a lot easier, I cook for a dozen people here at the senior living apartments and this would make life a little easier for me. Make it easier to open cans. The crank is easier to use when trying to open cans. I already own one and love it so much I want one for camping. It is really very easy on old hands. because the handle is FINALLY THE ANSWER to the other smaller one. We need this when the power goes out and the manual is necessary. That handle will be so much easier to crank.